DESCRIPTION: This is the second Haynes Manual to cover the iconic Spitfire and demonstrates just how far the restorations industry has advanced. The book follows the traditional series format with lavish illustration of the highest quality. After a brief introduction to the Spitfire in WWII, the manual looks at sourcing a restoration project, followed by a guide to stripping the restoration subject and detailing the components. From there, the manual moves logically through the engine, airframe, components, and assembly, concluding with flight and maintenance. After the last chapter, a set of very useful appendices provide some fine detail and list the Spitfire restorations under way in 2013. When the RAF set up its Battle of Britain Memorial Flight, it was considered the last chance to maintain at least one example of the Spitfire in flying condition and able to provide fly-by capabilities at air shows and memorial events. Over the years, the BBMF has expanded to include a Lancaster bomber and a Dakota transport, with a number of Hurricanes and Spitfires, several of which are airworthy at any one time. The film “Battle of Britain” has been credited with inspiring many restorations of Spitfires and Hurricanes. By bringing together a collection of Spitfires and Hurricanes to battle on film with Spanish license-built versions of Me109s and HeIIIs over the historic Duxford airfield, the film makers demonstrated more flight capable warplanes than anyone thought still existed. After the film, a number of the aircraft ceased to be airworthy but that provided a starting point for Spitfire restorations. The first restorations used up most surviving spares, but enthusiasts began to develop new components and remanufacture engines. Today, there is the potential to build a Spitfire from scratch without any original components or structure. Someone may go that far, but the real implication is that of the many surviving pieces of wreckage it is possible to restore original components and assemble an aircraft with these items, purchasing or constructing all the missing pieces to produce a complete airworthy machine. 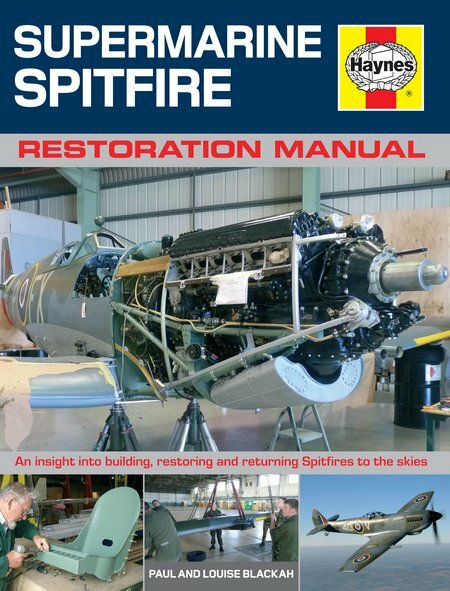 Reading this manual may inspire new restorers to seek out Spitfires that can be restored, but most readers will simply enjoy reading of the labour of love, and the years of dedication that go into bringing yet one more Spitfire back into its natural environment. There are some beautiful photographs and some high detail. This is yet another outstanding Haynes Owners’ Workshop Manual, although this time described as a Restoration Manual.